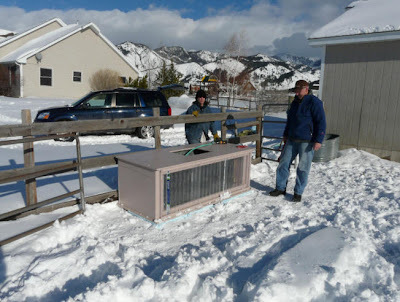 Build-It-Solar Blog: Our Solar Heated Stock Tank In Mother Earth News! Our Solar Heated Stock Tank In Mother Earth News! 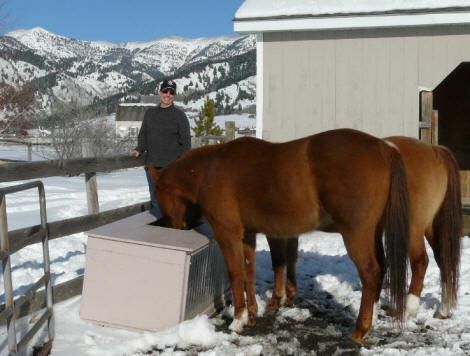 The new issue of Mother Earth News (October 2010) has a full article on the solar heated stock tank we built for our neighbor's horses. In cold climates, keeping the water in livestock tanks from turning into a solid block of ice can be a real challenge. One common solution is to use an electric stock tank heater -- this works, but the down side is that with the typical uninsulated metal stock tanks the heat loss and energy uses are huge. In our climate during cold weather, you can easily spend $3 a day in electricity just keeping a tank ice free. 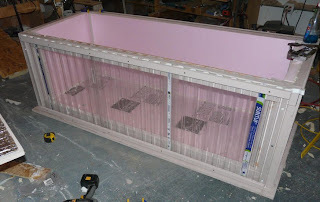 The insulated tank enclosure with south glazing. The Solar Stock Tank design encloses an ordinary galvanized stock tank in a well insulated box. The south face of the box is double glazed with impact resistant polycarbonate glazing. The south wall of the stock tank is painted black and absorbs the solar radiation quite efficiently. The insulation and double glazing reduce nighttime heat loss. The tank can be used without a heater in all but the most extreme weather. Its a pretty straight forward DIY build. The energy savings can pay back the cost of the tank materials in as little as a couple months. There is also a large saving in CO2 emissions associated with not using the electric heater. If you know of other tank designs, please let me know.